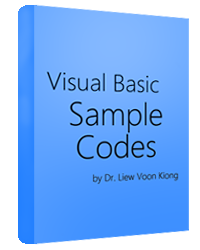 Visual Basic Samples Codes is the Latest E-Book written by the webmaster of our Visual Basic Tutorials, Dr.Liew. It comprises 258 pages of captivating contents and 48 fascinating Sample Codes. All the examples are explained in great details using easy- to-understand language and illustrated with gorgeous Images. On top of that, you can download the ORIGINAL SOURCE CODE for every sample in the book! By reading the book and using the sample source code, you will be able to master Visual Basic programming effortlessly! *Please wait for 10 seconds for PayPal to redirect you to E-book Download Page after ordering and making payment.